Make outdoor spaces more inviting with hardscapes in Millard. Heroes Lawn and Landscape is a trusted landscaping firm that offers a wide range of services. 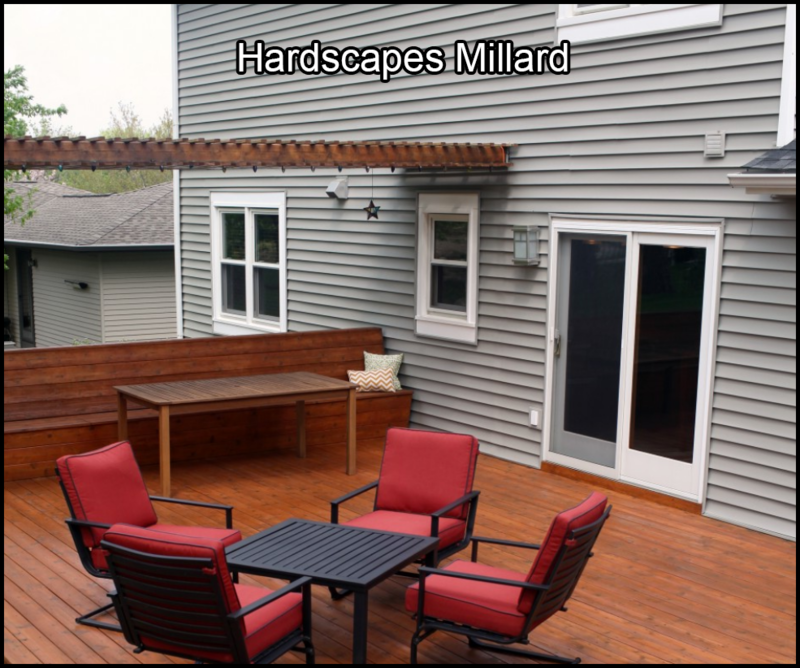 We design and install hardscapes in Millard, such as decks, patios, and pathways. If you’re considering adding a hardscape to your lawn or yard, we are the ones to call. What Are Hardscapes in Millard, Nebraska? A hardscape in Millard are man-made features that are incorporated into a landscape. They are made of hard materials such as stone, concrete, and brick, hence their name. We are highly skilled in all aspects of hardscaping. You can rely on us for professional design and installation of a hardscape on Millard lawns and yards. Why Incorporate Hardscapes in Millard Outdoor Spaces? To make a lawn truly stunning, you need more than just green grass, flowers, and trees. Hardscapes in Millard, such as stone pathways and patios, elevate ordinary lawns into visually appealing outdoor spaces. Also, a hardscape in Millard add texture and create points of interest on otherwise flat or featureless lawns. Hardscapes in Millard can be designed to complement your landscape’s architecture or create an attractive contrast against its natural elements. A great way to maximize your yard’s potential is by adding hardscapes. As Millard landscaping experts, we can transform the bare expanse of grass behind or in front of your home into usable space. Hardscapes in Millard such as patios, stone paths, and driveways help you make the most out of your outdoor areas. To improve your property’s curb appeal, you can’t go wrong with a hardscape. Millard home and business owners who plan on selling their properties in the future should consider hardscaping and landscaping. Hardscapes in Millard such as patios, retaining walls, and garden paths are appealing to many buyers and may even boost a property’s resale value. A sloping backyard presents a challenge to many homeowners. Ground that isn’t flat can cause water runoff, which in turn leads to soil erosion. An easy way to address this challenge is by having us build retaining walls on your property. A hardscape in Millard restrain soil in steep or even vertical areas, preventing soil from crumbling. Retaining walls can be used to create elevated flower beds and picturesque terraces. Additionally, they can be used to edge driveways for an elegant look. Don’t let the extra yard space behind your house go to waste. We custom-design and install patios according to our clients’ needs, style preferences, and cost requirements. Patios are very versatile—you can use these a hardscape in Millard as a place where you can relax. You can also use it as a venue for parties and gatherings. Whether the look you’re going for is rustic or modern, we can build the perfect garden path for your property. We can build paths out of bricks, pavers, stone, flagstones, or concrete. No matter what material you choose, you can be sure that a hardscape in Millard will add charm to your garden. Make your home or place look more welcoming with a beautifully designed and masterfully constructed walkway. We also build driveways that are long-lasting and complement the style of your property. Hardscapes in Millard are great additions to any landscape design. Apart from improving the appearance of outdoor living spaces, a hardscape in Millard also make them more useful. By having us conceptualize and construct their hardscapes, Millard home and business owners can make the most out of their lawns and yards. For projects that involve hardscapes in Millard, trust none other than Heroes Lawn and Landscape. Our goal is to turn our clients’ ideas for outdoor area improvement to reality. Apart from a hardscape in Millard, we offer an extensive range of services to keep landscaping in excellent condition. Call us to learn more about our services and to request a quote. Heroes Lawn and Landscape is a company that brings new meaning to the term, “full-service.” We are much more than just a landscaping company. Apart from landscape design, we also offer landscaping, lawn maintenance, mosquito control, and holiday lighting services. Learn more about how we can transform your outdoor spaces into showcases by giving us a call. You may also request a quote by filling out our online form. We look forward to helping you achieve the lawn or yard of your dreams.